I'm in love with my pink sophie necklace with bracelet that I received from kerry jewllery. Sophie Necklace and Bracelet Set feature a light pink beads with bright pink bicones and pink disco ball centre piece and defiantly a gorgeous piece of art. Tyne and Wear, UK. All Jewellery bought on website is Giftboxed free of charge and can custom make items. Items can be delivered worldwide. Sophie necklace and bracelet by kerry jewllery arrived in a beautiful pouch, but I wish it should have come in a box instead of pouch. At first glance, it reminds me of Tiffany bead necklace versatile and chic bracelet, when you will hold the necklace in your hands, you will know the quality piece of jewllery. I would say the quality of sophie necklace is quite same as tiffany, but the tiffany one is priced 98 USD after 85% discount when you can have the sophie one only in 20 Sterling pounds. 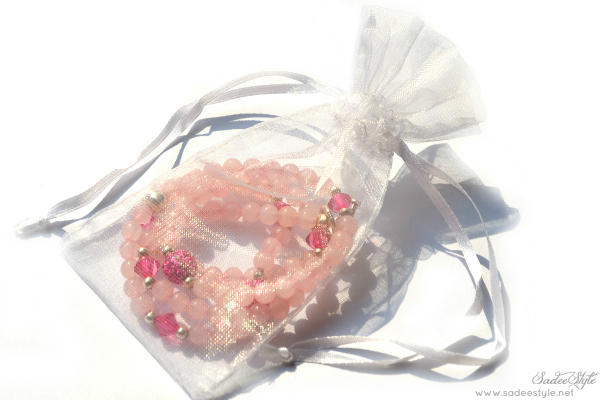 I love the combination of dark and light pink beads, it looks very classy yet modern and can be worn with any kind of dress and would be a best gift for your loved one! The best part of the necklace is a clasp, it very easy to close by yourself also bracelet comes in a clear stretch string elastic cord that can fit for any size. Kerry jewellery offer beautiful beaded necklaces, rings, bracelets, earrings, and hair accessories for women. Among these pieces they sell necklaces for little girls too, which would be perfect for your birthday girls. Do not forget to enter the code *Kerry* during checkout to get 20 % discount. I highly recommend that you head on over to Kerry jewllery and check out all of their gorgeous handmade high quality jewllery range at affordable prices!